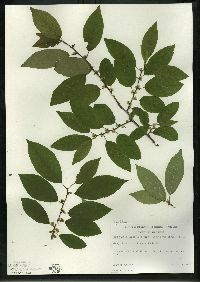 Shrub to 5 m tall Leaves: alternate, light to dark green, 4 - 10 cm long, 1.5 - 4.8 cm wide, elliptic to egg-shaped and tapering to a slender tip, sharply toothed, usually hairy beneath. Flowers: either male or female, found on separate plants (dioecious), four- to eight-petaled, borne near leaf axil, male flowers usually in clusters of six or more, female flowers solitary or in clusters of three. Fruit: fleshy with hard nutlets in the center (drupe), bright red, occasionally yellow, 7 mm in diameter, rounded. Twigs: olive-brown to purplish brown, becoming dark brown, smooth or hairy with raised, corky spots (lenticels). Buds: brown, 2 - 3 mm long, almost spherical. Similar species: Ilex opaca, Ilex verticillata, and Nemopanthus mucronatus have very similar fruit. However, other characteristics make them easy to distinguish from each other. Ilex opaca is a tree that has evergreen, oval to narrow elliptic, leathery leaves with a few spiny teeth along the margins. Nemopanthus mucronatus is a shrub with deciduous, narrow elliptic to narrow egg-shaped leaves that have few teeth or non-toothed margins. Habitat and ecology: Common in bogs, boggy woodlands, and edges of ponds. Notes: Many birds eat the fruit throughout winter. Etymology: Ilex comes from the Latin name of the holm oak (Quercus ilex), which has leaves similar to those in the Ilex genus. 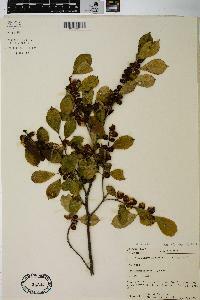 Thus, the genus Ilex was named after this species of oak. Verticillata comes from the Latin word meaning whorled, referring to the clusters of flowers forming somewhat of a ring around the stem. Local in the northern part of the state. It is rather frequent in some parts of the lake area in swampy and boggy places, becoming rare south of it. 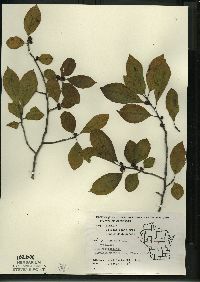 This species is very variable in the shape, texture, and pubescence of the leaves, and in the color of the fruit. These variations have been named, but I am recognizing only one [variety padifolia]. There is a yellow-fruited form which I have found once. All forms are on one map. 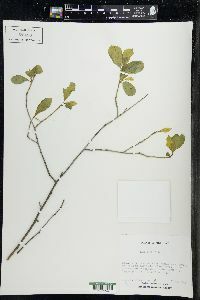 My few specimens of variety [padifolia, a form with leaves that are narrower (mostly 2-2.5 cm wide), thicker, and more yellow-green than the typical variety] were growing in wet places in hard, white, slightly acid soil in the "flats" of the southern counties. 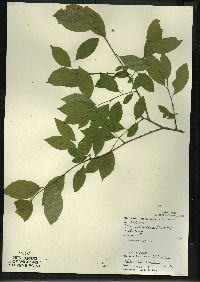 I received, however, from Mr. and Mrs. Walter Neff a specimen from Carroll County that was collected in a springy place. Specimens have also been collected in Jasper and St. Joseph Counties. This variety seems to be a complex but with a limited amount of field study I am not able to determine whether these differences are ecological or morphological.